Two months after celebrating her 93rd birthday at Martha’s home in Bedford, Mrs. Martha Kostyra (Big Martha as she is known) passed away on November 16th. She had suffered a stroke earlier in the month and was recovering in hospital near her home. Those of us who know Martha through her television show and magazines have also grown to know and love her mother. Vivacious, strong and vital with beautiful eyes, a strong mind, a gentle wit and a breezy sense of humour, Mrs. Kostyra was a joy. She was born on September 16th, 1914, the daughter of Polish immigrants. She married her husband, Edward Kostyra, when she was very young and had six children: Eric, Martha, Kathy, George, Frank and Laura. The family lived in Nutley, New Jersey, where ‘Big Martha’ worked as a full-time homemaker and part-time teacher at a local school. Martha Stewart credits her mother with most of what she learned in life, from keeping a home functioning beautifully to persevering through all of life’s challenges with a sense of calm, determination and dignity. Mrs. Kostyra made frequent appearances on Martha’s television show and became a friendly face to all of Martha’s viewers. Mrs. Kostyra would share her time-honoured recipes on the air, often exchanging witty repartee with her daughter, sharing anecdotes about the past and, especially, laughing warmly at the happy memories she would share. When I first read the news on Martha’s blog, I felt a loud but brief ringing in my ears. It was unbelievable to me. I was shocked and deeply saddened. I got tears in my eyes. Mrs. Kostyra always seemed immortal to me, somehow. She was still driving her old Volvo around town, still able to bend down and touch her toes, still able to move about freely with nary a hint of difficulty, still so sharp and funny and charming at the age of 93. When I returned home from work, I searched for the February, 2004, issue of Martha Stewart Living. 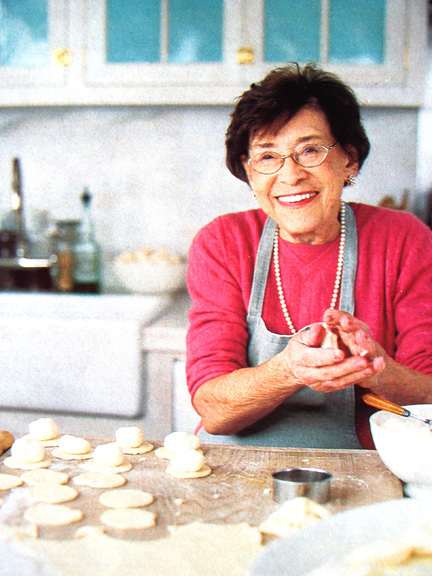 I recalled that there was a feature on Big Martha and some of her best-loved recipes. I wanted to see them again. 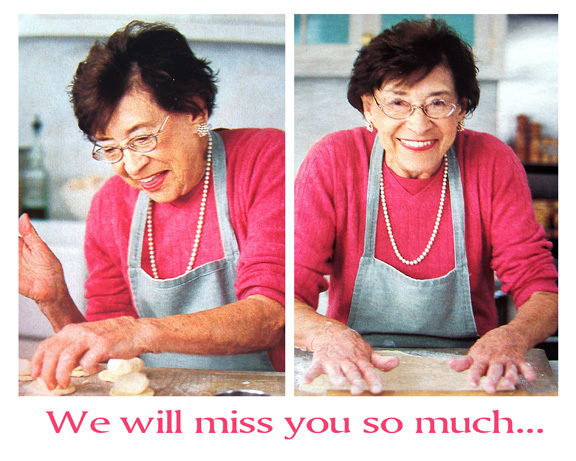 I wanted to see the photos of her laughing in Martha’s Westport kitchen, rolling out the dough, preparing pierogies, wearing that cute little apron. The photos in this posting are from that magazine. It seems strange to know she is gone. But what a life she has lived! She raised 6 beautiful and successful children. She created equally beautiful memories for those children, as all good mothers do, and she even had the generosity to share some of her recipes and inspiration with us – the viewers. I think I speak for everyone who admires and loves what Martha is all about when I say that we will miss her so deeply. I know, too, that she will be honoured, through and through, and never, ever forgotten. I certainly hope that Martha does, indeed, put together a book about her mother: a collection of memories, photographs, tips and recipes from this glorious woman we all came to know as Big Martha. I’m sure she will. Our thoughts are with you, Martha, and your whole family. Know that your mother will live on in our hearts, just as she will in yours. It is so sad to think that Big Martha is gone, I am so glad that Martha shared her with us all of these years. She is just adorable! R.I.P. Martha Kostyra. We will miss you so much.